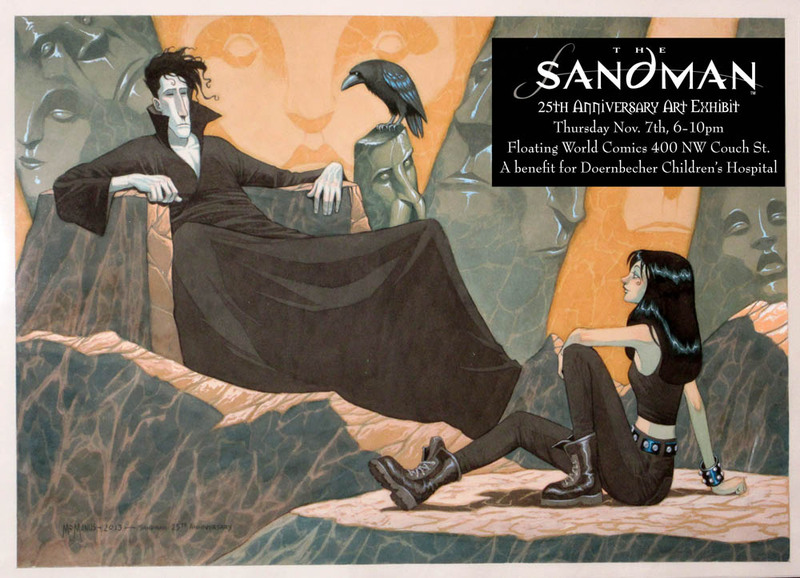 Twenty Five Years ago, the first issue of Sandman was released and changed the face of comics. Not only was Sandman the flagship title for the Vertigo imprint from DC, but it has also won many awards including the World Fantasy Award (for Sandman #19, a Midsummer Nights Dream), more than 20 Eisner Awards and a host of other awards and critical accolades. Now with the 25th Anniversary, Neil Gaiman returns to Sandman with an all new limited series, Sandman: Overture, with art by J.H. Williams. The first issue arrives in stores October 30th. To celebrate the anniversary of the groundbreaking series, we are celebrating with an art event showcasing new works created by some of the best artists in the comic industry. This show will feature the artwork of Michael Allred, Richard Case, Farel Dalrymple, Ben Dewey, Tadd Galusha, Shawn McManus, Tradd Moore, Russel Roehling, Nick Runge, Bryan Talbot, Rebecca Woods, Michael Zulli, and Chrissie Zullo. For this event, we will be donating 100% of the proceeds from the gallery show and art sale to Doernbecher Children’s Hospital, which has been ranked as one of the best pediatric hospitals in the United States. Join us Thursday November 7th where we will have exclusive prints only available in-store at the opening. Artwork will be on display until November 30th.